1. Teaching restaurant owners about food challenges – There are currently 59 finished articles within the PROMOTERS section teaching restaurant owners and marketing professionals about how to create, host, and market proper eating challenges based on a variety of factors such as geographic location and clientele. By helping restaurants create better food challenges and promote their businesses more effectively, we are not only really helping the restaurants, but we are also helping to create better challenges for the eaters of our community. Eaters only have so many restaurant challenges available around them, and typically a person is only allowed to beat a challenge once, so we need to inspire more restaurants to create great challenges that our eaters will really want to attempt and help promote. As the “movement” continues to build, more and more restaurants will join in, and they will know what to do now, strictly because of the advice on our website. 2. Teaching eaters both basic and advanced tips & strategies – Other than RandySantel.com, there are no other websites available on the internet for people to get food challenge & competitive eating tips and advice. It is very hard to become interested in something that you have absolutely no idea how to do. Training for an eating competition is definitely nothing that could be considered “common sense.” There are 67 articles within the TIPS section that answer every question a person could have about preparing for, winning, and recovering from food challenges and eating contests. There are 40 articles within the STRATEGIES section detailing all of the different strategies that you need to follow to win every single type of food challenge. If an article is not finished yet, it will be soon, and eventually we will have videos to go with each and every article to help the visual learners of our community. We will help people learn the HOW that they have been searching for. 3. We are focusing on food challenges first – There are many reasons for this initial strategy, but we are now focusing 95% of our efforts on food challenges to start while FoodChallenges.com is virtually unknown. Eating contests typically happen once per year, but food challenges are available at least once per week all year round. For businesses, the purpose of an eating contest is to basically promote the restaurant as much as possible while hosting just one event. The purpose of a food challenge is to help market the business all year round. Once FoodChallenges.com becomes a household name in the food world, just like Bodybuilding.com is in the giant bodybuilding world, we will then shift some focus towards promoting eating contests along with food eating challenges. Also, anybody can win a food challenge because it is just that person vs the food and time limit set by the restaurant. To win an eating contest though, you have to beat all of the people you are competing against, which is much more difficult in most cases. A huge majority of competitive eaters initially started training by dominating food challenges. We will inspire potential eaters while focusing on food challenges, and then shift towards eating contests once our brand is large enough and we are teamed up with significant sponsors. 4. We are FOODCHALLENGES.COM!! – We invested a lot of money to procure the top-level website domain name FoodChallenges.com, and we did not settle for anything less. If you want to buy a car, you go to Cars.com. If you want insurance, you go to Insurance.com. If you need a surety bond, you go to SuretyBonds.com. If people want to find and learn about food challenges (there are now over 3,000), they will go to FoodChallenges.com. People will feel comfortable browsing and trusting the website simply because of our domain name. There is a reason that Bodybuilding.com is the #1 bodybuilding website on the internet, and it is because of their domain name!! 5. We are going to DOMINATE the internet – FoodChallenges.com is going to dominate both the internet and social media, simply because we have absolutely ZERO competition. Our only online competitor right now is RandySantel.com 🙂 Our social media will attract food lovers of all different types, and not just the people interested in food challenges and competitive eating. This will help drive traffic to the website and keep everyone updated about what is going on around the world within the competitive eating community. More importantly, we will absolutely crush the search engines. “Food Challenges”, “Competitive Eating”, “Speed Eating”, “Eating Challenges”, and other related key terms & phrases have very little competition, so soon we will dominate all of them because of our domain name and articles. If somebody searches for anything related to competitive eating or food challenges, a FoodChallenges.com article will show up on the first page. We also have all of the food challenges in our database optimized for Search Engine Optimization (SEO) so that when people search for specific restaurants with challenges, our site will show up. Lastly, we will dominate YouTube too. When somebody searches for food challenge and eating videos, either a FoodChallenges.com or Randy Santel video will show up, each directing people to the same place so that we can expand our new brand. 6. We are going to build a united competitive eating community – We are going to both build and expand the competitive eating community through many different resources. We will use our social media to attract new eaters and fans while promoting the existing eaters and restaurants within the community, and eventually our sponsors too. We will soon sell apparel that everyone will be able to order and wear to help expand our brand to their friends and local community. We have some brilliant t-shirt ideas that people into fitness & lifting will absolutely love!! We will have representatives participating in food related sporting events and activities so that we can also promote living a healthy lifestyle while still enjoying food at the same time. Eventually, once we have the resources and volunteers, we will be able to sponsor community outreach activities to help members of our community too. Most importantly, we will be promoting all of the “community building” features that can be found on our site such as the social application and forums. As our numbers grow, so will our ability to attract sponsors, media attention, and new events. Starting a UNITED community will be the toughest part, but we will be unstoppable once we begin really gaining momentum. Things will get exciting when we get to that point!! 1. World Food Challenge Day – We want to establish a day where eaters all over the world agree to do a food challenge on that particular day, in all of the over 23 countries with food challenges. Along with that, we will get as many restaurants involved as possible to help us promote the day via advertisements, promotions, and organizing media coverage. How crazy would that be? The day would be similar to “Small Business Saturday”. 2. A Global “Eating Olympics” – The current eating organizations only recognize that competitive eating exists in the United States, and they totally ignore all of the over 22 other countries. The only bigger joke than that is people thinking that competitive eating will one day become an actual Olympic sport. That will never happen, and we don’t want it to become one anyway. It will take a ton of people helping and some big-time sponsors, but eventually we will hold an “Eating Olympics” where we fly the best eaters from countries around the world to one particular city to compete in different eating events sponsored by multiple local restaurants in the area. 3. A LEGIT competitive eating reality show – This is the least important goal, but there has not been any serious food challenge related television shows since Man v Food Ended In Early 2012. Whether it is in the United States, England, or Australia, once we can prove that there is a large amount of interest, we want to work on putting together a competitive eating reality show similar to the UFC’s “The Ultimate Fighter” hit television series. 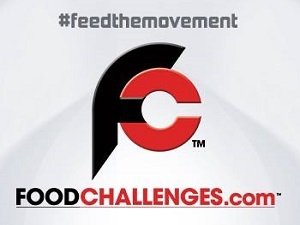 Thanks for reading “What FoodChallenges.com Is Doing To #FeedTheMovement” and using our website! !